by Robert Schnase. Abingdon Press, 2018. Robert Schnase, United Methodist Bishop of Missouri, presents five congregational practices which inform congregational health and vitality. These include: radical hospitality, passionate worship, intentional faith development, risk-taking mission and service, and extravagant generosity. Each of these are described as both basic and essential to congregational life. Schnase handles each practice in careful depth. The use of his adjectives to describe each practice becomes an important bench mark. 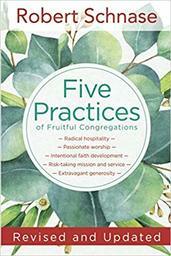 Schnase insists that each practice must be pursued with as much passion and excellence as a congregation can muster. It is simply not enough for congregations to be “good” at mission and hospitality while neglecting worship. To this end he offers helpful study exercises and conversation starters and metrics to help evaluate how congregations are doing. While there is some repetition in this work, it is well-summarized in the last chapter on “fruitfulness”. It is a discussion on the value of the congregation’s practice to the advance of the Kingdom of God. Here Schnase argues that accounting numerically for how a congregation is doing implementing the practices is both needed and valuable for purposes of accountability.